If you need assistance with your garage, you have come to the right provider! 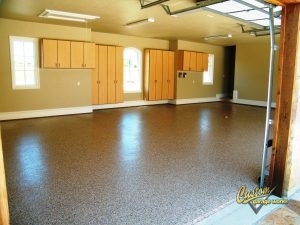 Recognized for our custom garage floor coating in Aubrey, TX, we originally began our business in 2003. After searching high and low in the existing industry, we were shocked to find very few options that were up to a top quality standard, so we got into the industry ourselves, to turn things around. Now, we proudly provide professional garage storage solutions, along with top-of-the-line polyurea polyaspartic floor coatings, that have a much longer lifespan than epoxy. Our team is professional trained, and we are passionate about creating custom garages, with impressive garage floor coating results across DFW. Going up in popularity with each passing year, our garage floor coating in Aubrey, TX is among the best you’ll find in DFW. This is because our polyurea polyaspartic coatings create a superior finish that remains for decades. Unlike epoxy that can yellow in the sun, and peel or fall off over time, these coatings are stronger and more durable. And due to our use of a diamond grinder instead of risky acid etching for floor preparation, we can ensure a greater amount of adhesion, which leads to a better installation. To schedule your free estimate, and to learn more about our garage floor coating options, contact us at 214-494-9068 or 817-308-1305! Garage Floor Grinding Our diamond grinding technique will help you get the optimal surface to apply your floor coating to. Epoxy Coatings Epoxy coatings are a common form of garage coating, but they aren’t the best option available! And More! 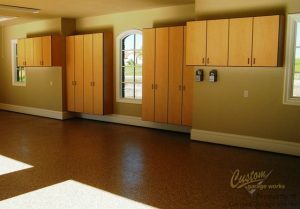 Discover more about our selection of custom floor coatings, and determine which one will work best for you! As for storage, you’ll never have to wade through piles of clutter in your garage again when you choose a storage solution from Custom Garage Works. The greatest custom garages have an organization method in place. To meet the unique organizational requirements of our customers, we offer a variety of different organization products, including overhead storage racks and cabinets. Unlike other business, our storage racks are designed for heavy duty weights, and our garage cabinets are designed specifically for installation in garages. If you need a resilient garage floor coating in Aubrey, TX, and unmatched organization solutions, you can depend on Custom Garage Works. Overhead Storage Racks When you need to get more from your overhead storage space, our storage racks provide resilient and dependable storage. Car Lifts Our car lifts help you store your vehicle with style and accessibility, and they will not scar your garage floors! And More! Do not be worried by clutter in your garage any longer. We have the organization products you requires!